If books are ‘under threat from new media’, then these new media are undoubtedly the Internet and ebooks. You get some great writing online, and in so called long-form too, but you stumble on these things while you’re doing something else, and your mind can’t possibly know what it’s missing, and whether it’s read a given percentage (or a balanced selection) of writing on a topic. Books are different. When you pick up a book, you’re most likely in a bookshop shopping for books, or in your own home looking for a new book to start (or an old one to refer to), or in a library looking for a book to borrow. Your mind’s in book mode, and is paying attention to the book market, in whatever form it takes. When you delve into the book itself, your attention is not being hailed by adverts, or dastardly links within the text. Adverts may be the researcher’s worst enemy as far as online reading is concerned, but even ignoring them you’re being enticed towards other articles, only a click away, as well as desperate publishers offering you other stuff you ‘might like’. If you wanted to read those things, surely you’d be reading them, yes? Or would they be directing you back here? You have your book in front of you, and it commands your full attention. References to other related sources are in footnotes and endnotes, waiting for you to decide when you’re ready for them, depending on where your research takes you. When you put the book down, finished, then the onus is on you to decide what to read next, and perhaps you’ve already made that decision – a quality decision – hours, days or weeks ago. The next book’s on your reading pile, of course. So your attention is on the book, and fully on the book. If you’re taking notes, you’re extracting what you need, not what the book ‘wants’ you to ‘take away’. You’re your own master. So with all this attention available, what are you going to do with it? Well, as you’re not reading a short article online, you’re spending longer reading about the one topic. Avid readers will attest to the hours which slip by while ensconced in a good book, whether fact or fiction. And at the other end you have moments in which to soak up your knew experience and knowledge, without your eye being stolen immediately. You’ll have delved deeper into the subject, ranged wider within its boundaries, and had time to understand what the author was saying, and meaning. The words will not be flavoured with a tone to increase page views or move you as swiftly from one topic to another. You have given the writer permission to take you on a journey, from beginning, to middle, to end. In return, you will be guided along an unfamiliar yet rewarding path, the author at your side to point out the landmarks, safe in the knowledge that your attention span extends beyond the next sidebar, the next flashing banner, and that you’re here for the long run (or walk, or stroll). You’re also probably sitting comfortably. There is no eye strain from staring at a glowing rectangle, no wondering whether the text could be bigger, or rendered in a more attractive font should you wish it. There are no buttons; you are simply engaging with the material on which the words sit, finishing one side before moving to the other. The words remain exactly where they are, immortalised on the page in a way which the e-book reader imitates, but forever merely pretends. This is a medium which gives words their proper place and respect. Just holding the book, working your way from front to back, your brain and fingers are constantly aware of how far you are through the page, and through the book as a whole. Your journey is laid out before you, the topic’s very size is visible in front of you, not encrypted in bits and bytes in a microchip or The Cloud. A book is yours, in your hands, a companion on the path, marking out future time and leaving a breadcrumb trail behind. You stare at a website but you engage with a book. It moves from pristine volume to dog-eared tome, bearing the scars of love and use. A Kindle merely sits there, unchanging, wondering whether you might also like this other book, or this other one. Or this other one? A book takes you away, and keeps you there; digital type merely tries to steal your attention for as long as possible, eeking each penny and moment out the precious resource which is your attention. Off Book is an amazing series of videos I’ve just discovered from the US network PBS. The videos are short – about 7 minutes – and cover things like design, animation, culture, art etc. I’ll definitely be watching more of them, but the one we’re interested in here is We ❤ Retro Media, where a string of people talk about why they love older, ‘obsolete’ analogue media for their entertainment, in preference to MP3s and digital downloads. Among those formats getting a loving mention are VHS, cassette, vinyl records and Super8 film. What’s so great about retro formats? These formats need action and attention to use them. You need to choose a disk, for example, look at its cover, wrestle it onto the turntable and place the needle into the groove. So you become familiar with the cover art, the structure of the sleeve, the album name, the track list and so on. The suggestive montage of iPod wearers who don’t appear to actually know what they’re listening to is damning enough for me. Memories are created: what was the first album you bought? Do you remember being overwhelmed by the shelves of CD cases or vinyl sleeves? Do you remember the shop? Or tearing the wrapping from the Christmas present? There’s a good chance. And now do you remember the first time you downloaded an MP3? No, probably not. There are factors of rarity, and comparison. You can pass them physically to a friend, forcing you to place value in what you’re losing (albeit temporarily) by giving a way, or what you’re gaining through the exchange. There’s social interaction and friendship all bundled in there for good measure! Perhaps unsurprisingly these formats lend themselves to niche trends (psych-folk, Dutch House, avante garde cinema), and this is because you can interact more directly with an analogue production method. You can scratch film or smudge the chemicals on a Polaroid to get unique results, perhaps even different to what you thought you’d get. This just adds to the specialness of the specific example you hold in your hand. It’s yours. As well as listing the benefits of semi-obsolete formats, we mustn’t forget the magic embedded in them and in their use. Think of the strange effects you get of partially recording over a programme with another programme, and the jarring transitions (or odd continuities) that result. As one man says of analogue film photography: there’s a “warmth and chemical chaos” which you just don’t get when you use the same filter on Instagram as you mum does. When you use the unpredictable world of analogue, you can’t help but set yourself apart from other artists. Rightly, another talking head mentions that there’s no point arguing over the superiority of one over the other. Digital has great strengths – portability, convenience – but when you want to immerse yourself in a favourite activity, or lose yourself in unique creativity, then there’s nothing like embracing the entropy of messy chemicals and decades-old technology. Stephen Ramsey has written a series of articles about the advantages of typed interfaces, that is those programs which you use from the command line by typing instructions rather than clicking on ‘buttons’ with a mouse. While I don’t necessarily agree that it’s easier to remember the correct commands than it is to fumble through different menus and shortcuts, he does make a good point about the modern antithesis of the command line: Apple products. Apple products ‘just’ work. Plug them in, press the button, and music appears on your iPod; films appear on your iPad. But, if it breaks, good luck trying to fix it. Yes, you can take your Macbook apart, or give your iPod to a shop in the hope they can replace the screen. But there are so many other things that – as thousands of people have surely found out – are impossible to diagnose, let alone fix. In those cases you’re going to have to get another. This is bad for your pocket, bad for the environment, and bad for computing. In Ye Goode Olde Dayse repairing the lawnmower or the TV was not just a matter of saving money, it was a matter of course. They were simpler objects, admittedly, but thinking that your computer or gadget is a black box from which no knowledge shall escape is exactly what the companies who seal these things together want you to think. One of the benefits of learning to use the command line is that you know a lot more about your computer and how it works. You get used to where different parts of the system live, where programs store their configuration and what you need to back up to preserve it. You build an appreciation of exactly what your computer is. And you can find out what’s gone wrong. One of the assumptions people make with command lines is that they’re for power users. They’re for people who want to do complicated things. But the truth is that command line tasks are very basic: list the contents of the folder, copy, paste, move, edit a file. The beauty is that you can then put these building blocks together to build whatever you want. Just because you don’t know how to built a decent wall doesn’t mean a brick is complicated. Show off to your geeky mates. I’m sure there are others – feel free to share in the comments! Or what happens to a room full of journalism students when you start handing out typewriters. 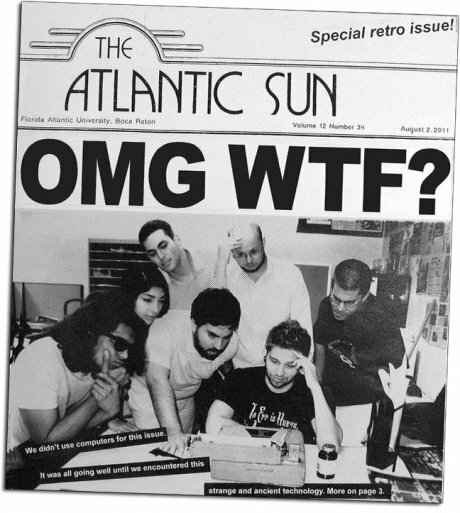 All on Paper was a project at Florida Atlantic University, and it involved a handful of 20-something trainee journalists turning off their iMacs and getting out the typewriters, TippEx, and photo-developing chemicals. This was technology older than they were, going through processes which seemed ridiculous with thirty years’ hind sight. But these kids learnt something (and so did their teachers). And one of the main things they found different was a sense of humanity – they had to work together, to overcome dodgy equipment, to play their part in the workflow. Just having more steps in the photography process brought people together. They had to work in teams, and in concert with each other. They know that little bit more about what went into the work of their forebears, and had a bit of fun too. After looking at a finished page – a page that took us half a day to finish – we felt so content and satisfied. I’ll compare it to the difference between buying a McNugget and hunting down your own chicken, gutting it, deboning it, and cutting it into nuggets. Is there anything you can do in your own work which would take you back to basics like this lot? So, an introduction is necessary. What is Unconvenient all about? And much of this would not be possible (indeed typing this would not be possible) without technology becoming increasingly democratic, no longer expert-only, beautiful, seamless and fun. But it’s becoming increasingly clear that we are becoming dependent on these devices and processes. We forget where our food comes from. We crank out words, comments, opinion without so much as two seconds’ thought, or effort, required. We no longer need to curate or restrict our own output: computers can handle the lot. It’s easy. Almost too easy. And it’s also not as fun, or rewarding, as it could be. Have you ever had the pleasure of growing, then eating your own food? How did it feel to reach this pinnacle of achievement? To hold and taste the fruits (or vegetables) of your labours? How about producing a fanzine by carefully choosing, snipping and pasting pictures and text together, then assembling the pages before pressing them into eager fans’ hands? Do you remember taking your new digital camera on holiday, snapping 30,000 identical beach shots and then burying them in your PC never to be seen again? It’s become too easy to produce, and the things we produce are too numerous, redundant, disposable, thought-free, forgettable, effortless. We’ve lost the connection between what we do with our hands, and the product that comes out of it. We’ve forgotten the joy and satisfaction that comes with spending time on something, and making something that only we can make. That can only be seen or experienced in the original. We’re here to remind you that it doesn’t need to be this way. People are rediscovering the joys of being close to the process of creation, and their efforts are unique, beautiful, idiosyncratic, time-consuming, educational and considered. One man draws out the wire, another straights it, a third cuts it, a fourth points it, a fifth grinds it at the top for receiving the head: to make the head requires two or three distinct operations: to put it on is a particular business, to whiten the pins is another … and the important business of making a pin is, in this manner, divided into about eighteen distinct operations, which in some manufactories are all performed by distinct hands, though in others the same man will sometime perform two or three of them. The problem was that no one person made an entire pin. No one saw the pin through its creation from start to finish, and so there was no pride in the creation. Thus begins the separation of a craftsman from his work. Sure, productivity goes up, and that’s great. But products become generic, individuality of expression disappears, and your position in the workplace becomes… attaching pinheads to pins. William Morris was another soul who was concerned about a craftsperson being reduced to a repetitive task, not knowing or caring about the outcome of his or her work. Morris championed ‘useful work over useless toil’ and made efforts in his life to champion useful work. Unconvenient wants to encourage you to get to the heart of production, of creating, to see each stage in all its importance, and to take joy in a finished object. Many of today’s products and tasks have been delegated to machines. These machines have shiny interfaces, and one-button operation. The products and processes they perform are generic, sterile, one-size-fits-all, dull, lifeless. We lose appreciation and wonder for things that deserve it. When we forget that 18 steps go into making a pin, we take it for granted. “It’s just a pin.” Even the most advanced household gadgets become mundane. We lack appreciation for how much effort used to go into making things, and how every word, every frame, every tonne, pound and ounce had to be considered. We’re flummoxed when something breaks or our machines are unavailable. How do you change a tyre? How do you check your spelling in a handwritten note? How long does it take to boil an egg? Do things some yourself, for yourself. Get your hands dirty. Pull things apart. Grab a screwdriver! Get on the front line: do the research, use manual tools, do the long division, stretch your brain and your muscles. I’m not advocating taking all your iPhones and washing machines to the tip, or retreating to the woods and communing with the pine cones. In fact, we’ll be including computers from time to time, sharing those tasks that are beautifully ugly, bare-boned, wiry and unpolished. What we’re advocating is a break from the automated, distanced, done-for-you life we lead. Talk to someone face to face. Scribble some notes in a diary or notebook. Cultivate a new appreciation of Michaelangelo’s David [Can you believe he made that without a 3-D printer? ;)]. So have a browse, or subscribe to get new posts as they arrive. There’ll be tips, instructions, case studies, equipment, discussion, bashed thumbs and the satisfying peeling of PVA glue from fingers. You may just be inspired. If you can think of any more our readers might be interested in, do leave a comment!